"Ever since [the event] I have been amazingly clear and tuned in again! I feel like the shadow that was hanging around is gone, and I am at one with everything again. Thank you!" "Powerful healing journey! Definitely reflected in my Monday." "This was such an awesome experience! I can't wait for the next one." in a live ONLINE healing event! In order to experience the deepest state of relaxation, healing and transformation, you must go where you've never been before. This is the Total Immersion Journey™, which combines the ancient and modern sciences of meditation and sound healing for the ultimate experience of peace and expansion. Yoga Nidra is a guided meditation system that cleanses and expands the consciousness and energy, while also healing the nervous system. Binaural beats are a healing modality, delivered through Sound Off™ wireless LED headphones, that synchronize the brain hemispheres through specific frequencies of beats in each ear. The result of this powerful combination of modalities, along with pranayama and asana, sets the stage for a deep and transformative experience that has been described as something akin to a shamanic journey. The magic behind this scientific and spiritual journey is the fact that when we can change the vibration within our brains, we can shift to more positive states and experience an increase in love, joy, and wellness in all areas of our lives. How is the online experience different? The intimacy of being able to do this journey from your sacred home space changes the dynamics of the online experience compared to live in-person events. While the in-person events are transformative and have a special energy, the virtual platform allows us to go deeper and more personal into our healing process. Total Immersion Online is a healing circle. Each one has a specific topic and intention for healing. Compassionate space is held at the beginning for check-in and to set intentions, as well as at the end for sharing and questions. We will also incorporate journaling and other insight exercises to make this a deep and transformative experience. Join me online (see details below) for a powerful journey into relaxation and transformation through Yoga Nidra + Binaural Beats! A recording will be available after the event live. The event will take place through Zoom. Once you register, you will receive a link to enter the group meeting event. This will automatically download the Zoom application. You can also manually download it HERE. The nature of binaural beats requires the use of headphones to be effective. This is because each ear is receiving a slightly different frequency, and that discrepancy synchronizes the brain hemispheres. This effect is lost without headphones. Attend the event with no headphones - you will hear all the great music, and experience the benefits of the conscious visualization, but you will not have the subtle sound healing of the binaural beats. 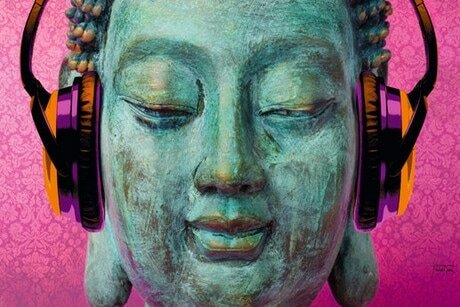 Attend the event with regular headphones - you can go without headphones for the beginning of the event during the dharma talk and stretching, and then plug in your wired headphones once you lay down for the meditation journey. ** If you plan to purchase wireless headphones for this event (and for future use), the headphones I use and recommend are Sound Off™ wireless LED headphones. ​Click HERE to purchase your own pair of Sound Off™ wireless LED headphones, and use the code KATYALOVEJOY for 20% off. & VIP access to the next 4 Virtual Healing Circles! The value of this offer is $245, and it's available for only $197 for a limited time! 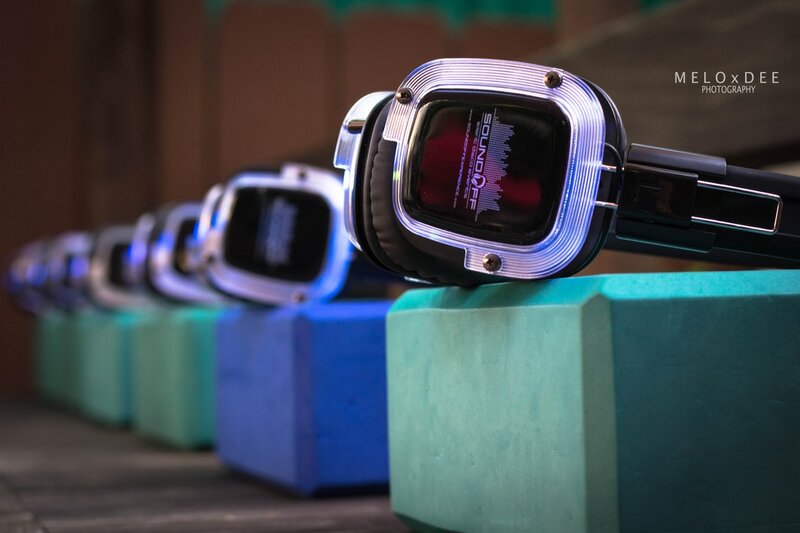 ​Save $48 and get your own pair of Sound Off™ wireless headphones PLUS access to the next FOUR online events!